File picture of Nagaland Chief Minister T R Zeliang. 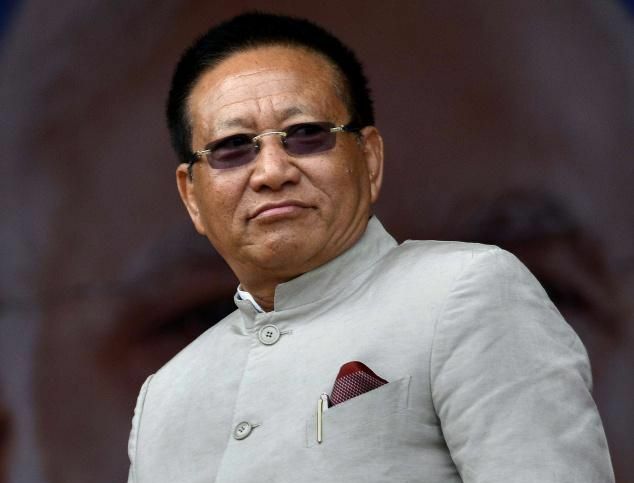 Political temperature soaring in Nagaland aday after Nagaland Chief Minister TR Zeliang sacked four of his ministers for allegedly attempting to topple him. The sacked ministers reportedly in connivance with former Chief Minister and Lok Sabha MP Neiphiu Rio tried to dislodge the incumbent chief minister TR Zeliang by gathering at a hotel in Kohima on Wednesday, seven of the legislators who were present at the meeting termed the dropping of the four ministers by the Chief Minister as “the right action at the right time”. In a notification on Wednesday evening, Chief Secretary Pankaj Kumar said the Governor of Nagaland on the recommendation of the Chief Minister has relieved four ministers from the Council of Ministers headed by TR Zeliang with immediate effect. The ministers were Tokheho Yepthomi, Y Patton, Dr Nicky Kire, and Neiba Kronu. According to reports, former Chief Minister Rio had a closed door meeting Wednesday morning with at least 18 MLAs at Hotel De Oriental owned by NPF president Dr Shurhozelie Liezietsu allegedly in a bid to topple the Zeliang government. Seven of the MLAs who were present at the meeting, in a signed statement on Thursday, clarified what they called the truth of the matter which transpired at Hotel de Oriental Grand on Wednesday. The seven MLAs are Pukhayi Sumi, Eshak Hesssum, Namri Nchang, Dr Longriniken, Deo Nukhu, Pohwang Konyak and Dr Benjongliba Aier. They said they were informed to attend a meeting convened by NPF Dr Shurhozelie Liezietsu at the hotel without fail. “In good faith, we turned up for the Meeting but to our surprise the gate was locked behind us once we had assembled inside the hotel and our car keys and cellphones were seized leaving us without any means to communicate with other people outside the hotel premises,” the seven MLAs claimed. After several hours, they said, they realised that the NPF president Liezietsu was not going to show up and that the whole “tamasha” was cooked up and orchestrated by Rajya Sabha MP KG Kenye and some few senior members. Later, Kenye arrived followed by Rio who addressed the gathering numbering around 16, they stated. The seven MLAs claimed that Kenye had the temerity to inform them that both the MPs had a meeting with Dr Shurhozelie the previous night for change of guard. “However, we learnt to our dismay that this was a total lie meant to sour the relations between Chief Minister, TR Zeliang and Dr. Shurhozelie Liezietsu,” they said. Calling whatever decision the Chief Minister had taken as “the right action at the right time”, the seven MLAs affirmed to continue to stand firmly behind his dynamic leadership. They further appealed to all the members not to create “such propaganda” in the future.